Miles beneath the ocean's surface in the dark abyss, vast communities of subseafloor microbes at deep-sea hot springs are converting chemicals into energy that allows deep-sea life to survive—and even thrive—in a world without sunlight. Until now, however, measuring the productivity of subseafloor microbe communities—or how fast they oxidize chemicals and the amount of carbon they produce—has been nearly impossible. A new study by Woods Hole Oceanographic Institution (WHOI) scientists has unveiled that these microbe-based ecosystems are surprisingly productive and play an important role supporting life higher up the food chain in the food-starved deep ocean. 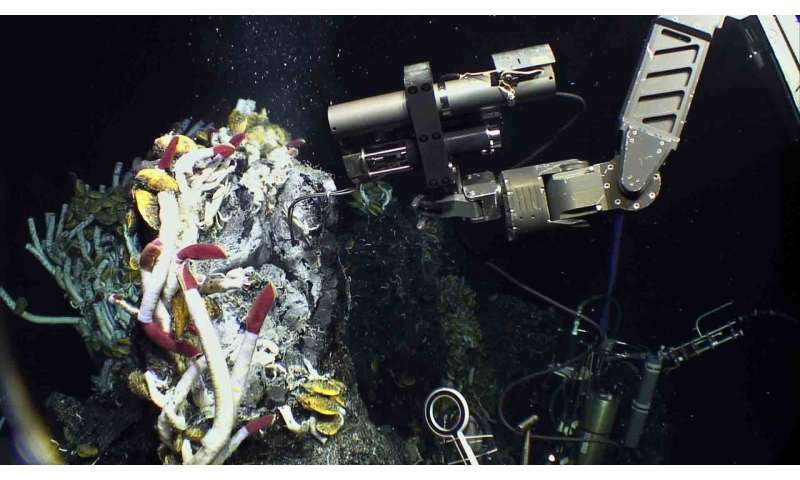 They estimate that worldwide, deep-sea hydrothermal vent microbial communities can produce more than 4,000 tons of organic carbon each day, the building block of life. That is roughly the same amount of carbon in 200 blue whales—making these ecosystems among the ocean's most productive on a per volume basis. The study appears in the June 11, 2018, issue of Proceedings of the National Academy of Sciences. "We found that microbial communities living below the seafloor at vents can generate similar amounts of carbon as the well-known animal communities above seafloor, like the tube worms, which are known to be as productive as rainforest ecosystems," said Stefan Sievert, a microbiologist at WHOI and senior author of the study. "The significant amounts of carbon these organisms produce daily provide an important source of food and energy for other organisms in the deep sea, where there's generally a lot less carbon available." As carbon from decomposing marine life sinks from surface waters to the deep, bacteria and other microorganisms chomp away at it until it withers away to marine gristle. "What's coming down from the surface to these depths isn't all that much, and not very digestible to deep-sea life," said Jesse McNichol, who conducted this work as a Ph.D. student at WHOI and is the first author of the study. The microbes at vents get their energy to live and grow through chemosynthesis, feeding off a chemical cocktail of hot hydrothermal fluids emanating from the ocean's crust. And they, in turn, represent the base of the food web, providing food for other organisms that require preformed organic matter, just like humans do. "So the microbes play an important role by generating new sources of carbon that other organisms can consume," McNichol said. "Based on the relatively small area that vents occupy of the seafloor, the overall productivity down there is small compared to what we see at the surface, but a little can go a long way in the deep sea and it also creates hot spots of activity near vents." Measuring the productivity of subseafloor microbe communities has been a daunting task. To accomplish it, the researchers collected microbe samples from a well-studied vent site on the East Pacific Rise known as Crab Spa. The vent fluids were collected in water sampling containers known as Isobaric Gas-Tight samplers (IGTs), which are designed to maintain the extreme pressures of the natural deep-sea environment where the microbes live. "If you bring the samplers up to the surface without maintaining the pressure that exists at the seafloor," explained Jeff Seewald, a geochemist at WHOI who developed these samplers and is a co-author of the study, "gases dissolved in the fluid will outgas, similar to when you open a bottle of sparkling water. This can change the fluid's chemistry and the activity of the microbes." In the lab, deep-sea pressures and temperatures were maintained while the researchers added chemicals such as nitrate, hydrogen gas, and oxygen gas to the samples. Through this process, the scientists were able to measure the rates at which the microbes consumed specific chemicals and how efficiently they converted them into biomass, a critical parameter to determine the productivity of the microbial ecosystem. To do so, the WHOI scientists teamed up with researchers in Leipzig, Germany, to employ a novel analytical method known as NanoSIMS, allowing them to match the identities of microbes with their rates of carbon production under different incubation conditions at the level of individual microbial cells, showing that microbes known as Campylobacteria (formerly known as Epsilonproteobacteria) were the dominant carbon producers. "Some of the microbes in the incubations doubled their populations in just a few hours", said Sievert. "This points to a very active subseafloor biosphere at deep-sea vents." Given the critical role these microbial communities play in the deep ocean, the scientists are looking for new and more routine ways to measure productivity miles below the sea surface. Recently, Sievert together with WHOI microbiologist Craig Taylor, microbial biogeochemist Jeremy Rich at the University of Maine, and engineers at WHOI have received funding from the National Science Foundation to develop a new type of sampling instrument known as the Vent-Submersible Incubation Device ("Vent-SID") that complements the IGT-based approach. "It is designed to incubate microbes and measure their activities right at the seafloor," explained Sievert, minimizing the time before incubations can start after taking a sample. Moving forward, the scientists also plan to measure microbial productivity at other vent sites across the global ocean to refine the estimates obtained in the present study. "We've been studying one type of vent system that is quite common, but we'd like to look at other vent sites where there's an abundance of other chemicals like hydrogen, for example, and see if the productivity values change significantly," said McNichol.